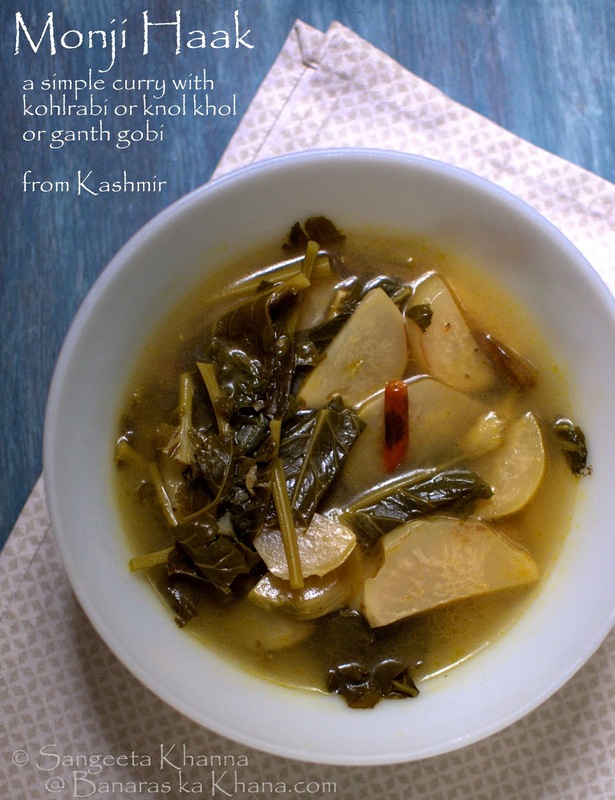 Monji haak or monji haakh is a simple stew from Kashmir that makes beautiful use of the bulb and greens of knol khol (kohl rabi or ganth gobhi). The simplest of recipes can be the tastiest and this monji haak is one of those examples. 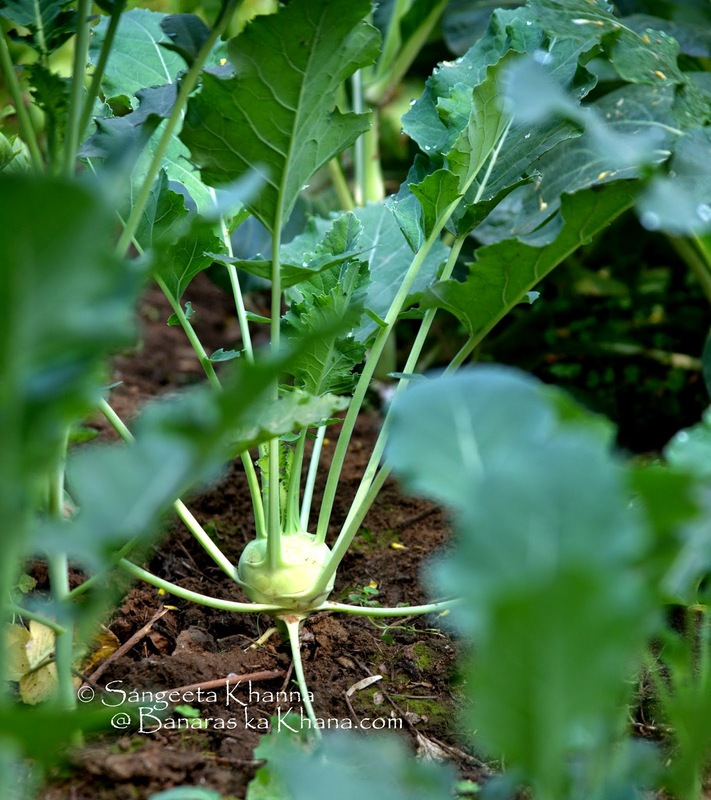 I followed Anita's recipe a few years ago once and never cooked knol khol any other way. Even when we had loads of ganth gobhi growing in the garden, I would always cook this monji haak either plain or with boiled or poached eggs or with mutton. 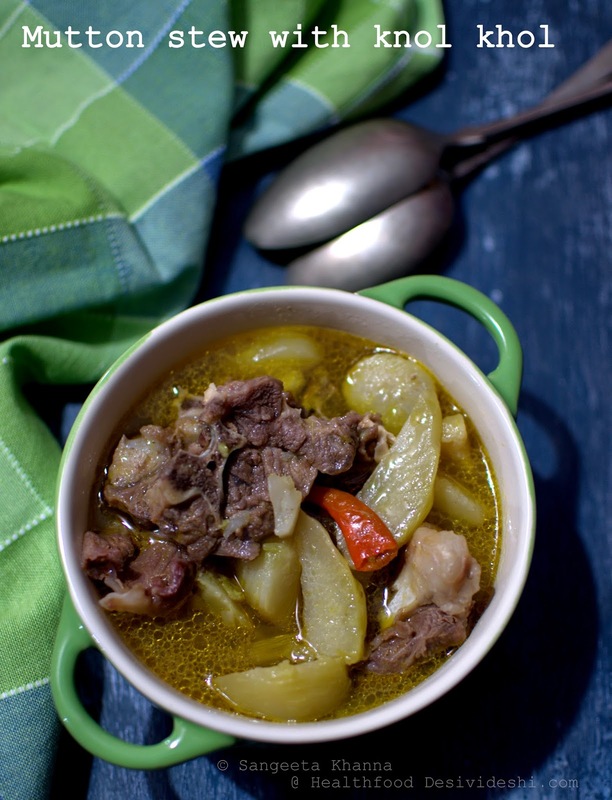 We love this simple and flavourful stew any which way. Another version of monji haak cooked with a little rice and a stew with knol khol and lotus stem, called monji nadru are slight variations of this recipe. Ganth gobhi stands tall in the garden. We had about 40 of them this season. 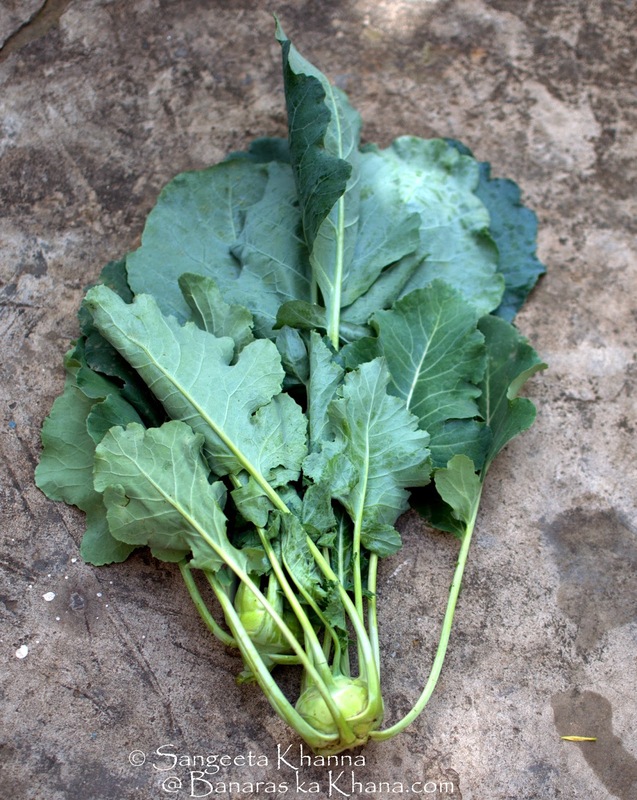 Ganth gobhi (knol khol) leaves are so fragrant and delicious that it can't be wasted. Sadly, many people throw away the leaves and use the bulb part only. Even my gardener often discards the leaves but he has now understood that I like the leaves more than the bulb. I hardly throw any part of this vegetable if it is freshly plucked. only the hard woody base is peeled off if the knol khol is mature. The curry is a simple recipe but I must let you know that following a simple recipe to the T is very important. As each ingredient and each little step in the recipe adds something to make it special, you can't afford to miss anything. Once you follow the recipe once and know how it turns out, you can make necessary changes to suit it to your taste. Peel the hard woody parts of the knol khol if it is mature or use it whole. Slice the bulb in half moons, the stems in one inch pieces and the leaves in large shreds. Keep aside. Heat mustard oil in a pressure cooker pan (or a deep stockpot or kadhai), tip in the hing and add the slices of the vegetable. Toss and fry till you see few brownish patches on the margins. Add the stems and leaves at once, the green chillies and salt and toss and cook for a few minutes more. Add the water and pressure cook for 5 minutes after the first whistle blows. Let it cool on it's own, open the lid and serve hot with plain boiled rice or as a side dish to any Indian meal. You can adjust the consistency by adding more water or by reducing the water as per choice. If cooking it in a stock pot or kadhai, cook covered till the leaves and slices are all thoroughly coked. It takes about 25-30 minutes or more if the ganth gobhi is mature. To make mutton monji haak, boil 300 gm of mutton (with bone) in 500 ml water and salt to taste for a couple of hours in a stock pot, adding a little more water of required. Or pressure cook for 30 minutes. Keep aside. Now follow the steps of cooking the ganth gobhi as above recipe of monji haak and instead of adding water, add the cooked mutton with the stock and cook again till the vegetable is cooked well. Serve as required. We eat our meats in watery stews like this in summers and love the way it tastes so rich and yet so light on the tummy. I recently tried a lauki ka shorba with mutton after reading good reviews of a recipe from Rampur and that also became our favourite. The recipe will be shared soon. Monji haak remains a favourite not just for being a simple stew or a patle rasse ki subzi as we call it, it is because I love the taste of ganth gobhi so much. It is a vegetable I look forward to. I still have a few left from our winter vegetables crop and they will also be cooked into this flavourful monji haak. Did I tell you we both love this mutton monji haak as a stand alone dinner? Yes we do.